Franklin Graham greeted people Wednesday, Nov. 7, at the Billy Graham Library in Charlotte, North Carolina, on what would have been his father's 100th birthday. The evangelist was there to sign copies of Through My Father’s Eyes, a book he wrote in tribute to his father. One hundred years ago, the man who would become known as the “evangelist to the world” and “pastor to presidents” was born on a dairy farm in Charlotte, North Carolina. But in his hometown on Wednesday, Nov. 7, Billy Graham was remembered by family members and ordinary people who loved him and his legacy of sharing the Gospel. 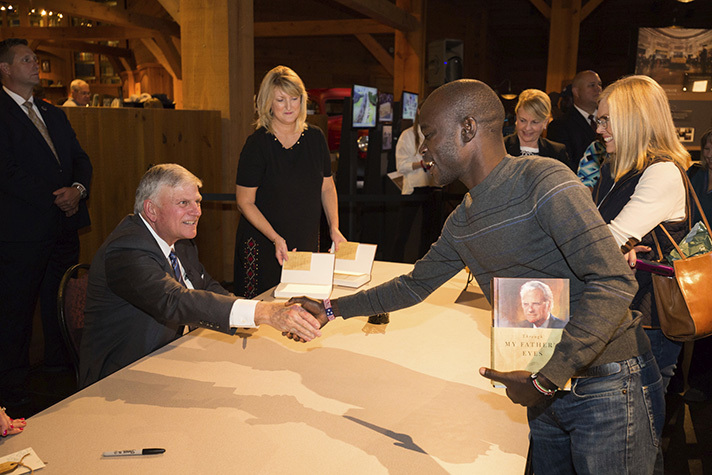 More than 400 people lined up outside the Billy Graham Library to meet his son, Franklin Graham; share a quick Billy Graham story; and get a copy of Through My Father’s Eyes autographed. Franklin visited with people and signed copies of the book he wrote to honor his father. The younger Graham began working on the book after his mother, Ruth Bell Graham, passed away in 2007. He finished it shortly before his father went to heaven on February 21, 2018. 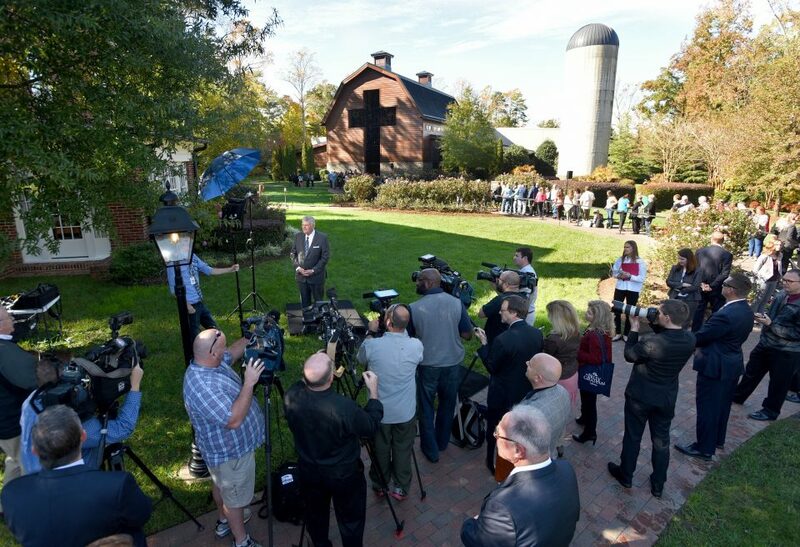 Franklin Graham (center) speaks to the media outside the Billy Graham Library before heading inside for his book signing. The tribute book, which was released in May, shares personal memories, anecdotes and powerful insights on the impact a godly father can have. “I think I’ll miss my father all the days of my life,” Franklin Graham added. “There’s not a day that I don’t think about him at some point during that day. Franklin Graham continues his father’s ministry, serving as president and CEO of the Billy Graham Evangelistic Association (BGEA). Flo Mazarakis waited eagerly in line to get her copy of Through My Father’s Eyes signed. Her history with the BGEA goes back 13 years, when she served as a prayer volunteer at Billy Graham’s 2005 New York City Crusade. The couple really misses him. “We’re planning on going out and still celebrating Dr. Graham’s birthday tonight because we found a place that makes really good coconut cake,” she smiled. 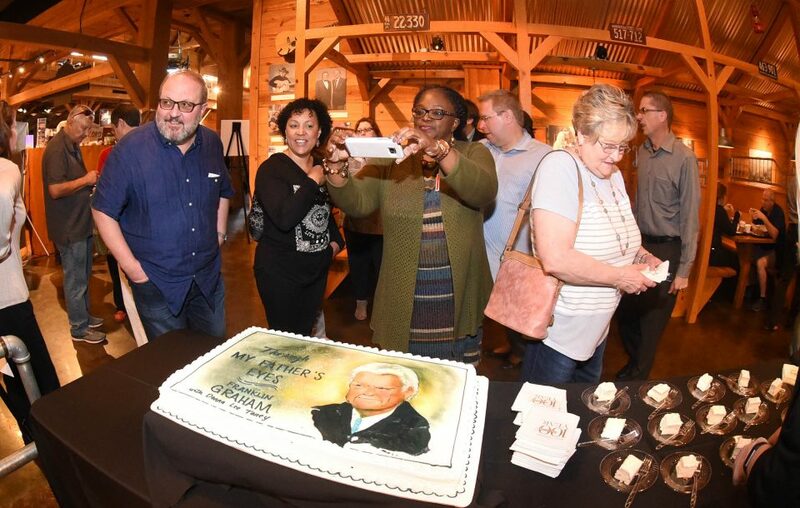 A woman takes pictures of a cake made to commemorate Billy Graham’s 100th birthday. Visitors enjoyed eating the complimentary cake and talking. Two guests traveled from Myanmar to celebrate Mr. Graham’s birthday. Ken Poindexter of nearby Iredell County, North Carolina, comes to the Billy Graham Library often because of what Billy Graham represents—the Gospel of Jesus Christ. Wednesday, he came to honor the evangelist and thank his son, Franklin. 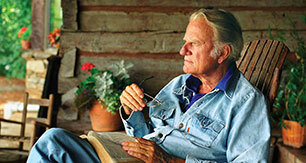 “What he is doing and what the Billy Graham Evangelistic Association is doing is actually transforming lives. “He is making a difference in people’s lives in this country and in the world,” Poindexter remarked. The entrepreneur heard Franklin Graham preach at the last stop of the Decision America Tour in Raleigh, North Carolina, in 2016. After hearing Franklin encourage Christians to run for office and stand for Biblical values, he took it seriously. On Tuesday, Poindexter was elected to his county’s Board of Education. “It made me take a stand at 61 years old,” he smiled. He has admired what the BGEA stands for since he attended all three nights of a Billy Graham Crusade in Charlotte, North Carolina, in 1996. Through My Father’s Eyes is available online at Ruth’s Attic bookstore. Do you have a personal relationship with Jesus Christ? Start here. 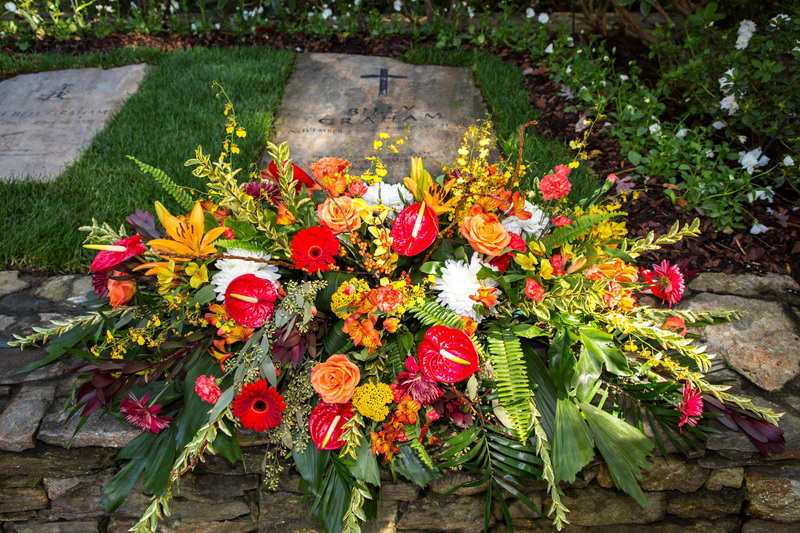 Flowers were placed at Billy Graham’s grave Wednesday, Nov. 7, to commemorate what would have been his 100th birthday. The grave of his late wife, Ruth Bell Graham, is to the left.